The journey from Lipu to Nanning is a thumbnail sheet of images from our two weeks. We drive through Yangshuo and its towering cliffs, then briefly rest at a cousin’s apartment before catching a train. In Liuzhou, the cousins kept telling us that if we’d come just a few days later, we’d see the city’s beautiful flowering trees in bloom. Sure enough, as our train passes through, pink flowers crown a few early bloomers. Finally, we reach the station in Nanning. With the sun down, the city is just awakening from the daze of a 90 degree day. We catch the bus back to the apartment where we stayed for our first days. Our indomitable host from before is not in residence, but her husband comes to the street to greet us, waving and smiling. He wants to take us out for street food, small plates in a nighttime market. Are we game? To my surprise, I’m not too tired, and am eager to eat. Jia is up for anything. Our host fetches the car and we go. It’s not exactly “I was barely holding broth yesterday” food, but by the grace of some strong medicine, my body isn’t protesting. It’s too delicious. We’re seated at a plastic table on the bustling street of stalls. Our host led us here, showed us seats, disappeared. He reappeared after the first round of food arrived: spicy snails with bamboo shoots. He brought big, juicy watermelon chunks in a bag and a couple of branches of loquats and then dug in with us. The food is served with toothpicks, chopsticks, and a plastic glove for your off-hand so you can handle the food without getting too messy. It’s messy anyway, but the table has provided a roll of tissue paper so we can wipe our hands, mouths, noses if they run from spice. 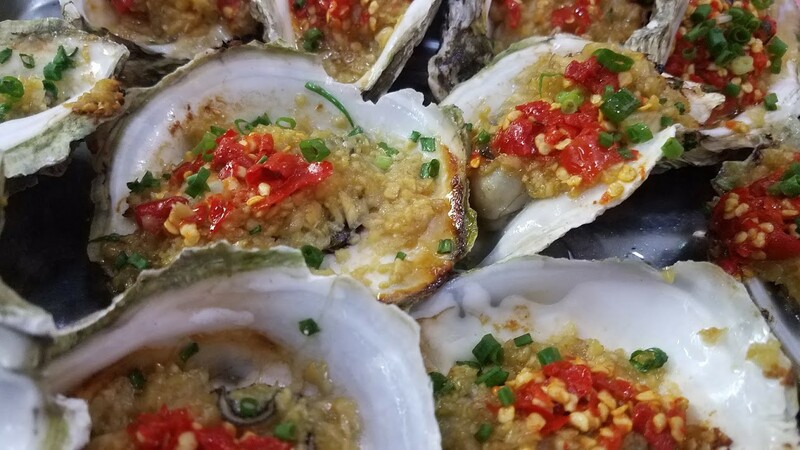 Grilled oysters smothered in garlic and chilies appear just as our host disappears again. I’m holding back from eating them all when he reappears, now with a bag of duck feet with tofu and cow intestines, soaking in a salty brown broth dotted with red bubbles of oil. Do we want a beer? He offers. We don’t, but it’s easy to imagine whiling away pleasant hours sipping, chatting, feasting, watching the street. More food: eggplant spread flat and grilled under a layer of minced garlic. We are growing full, but can’t resist going back again and again to dip our chopsticks in the soft flesh. The meal closes with one more course, another plastic bag from somewhere down the street: papaya chunks, perfectly ripe. The fruit slides up the long toothpicks as we lift it to our mouths, making fingers and wrists grow sticky with the sweetness. The night grows late; our bellies, full. Early flights await us in the morning. Good night, Nanning. Zai jian, China- until I see you again!